I can’t believe that my exchange will officially be over in 40 days. I also can’t believe that I have been living in Barbados for 7 months! It has gone by so so fast, especially since I came back at the end of January. There is going to be a lot going on in the next 40 days, including finishing up my classes, writing exams, my sisters (Ivy and Elle) coming to visit, and soaking up as much sun as possible before coming home. My classes here run later than the universities at home because I had a month long break at Christmas so I don’t finish classes until the 18th. My exams also start late because we have a study break before exams, so I have an exam on May 3rd and one on the 7th. I am really excited that Ivy and Elle get to come to visit me and we are actually all flying home together so they are going to be embracing my last week of living in Barbados. We just placed a massive swimsuit order (like I needed anymore!) for their trip and I swear Ivy is going to have enough swimsuits to wear 3 different suits a day and still never wear the same one. When I lived in France for a year I wrote a journal every single day and I wanted to turn it into a book. But honestly, my 16 year old writing skills were not that great and I still can’t read that journal without crying. I decided that I would also write a journal here in Barbados and lets just say my 20/21 year old writing skills are much better and so, I have decided that my summer project is going to be turning my journal into a book. (Who knows, maybe it will be a hit and I’ll become a millionaire and can stay in the Caribbean forever). I know that leaving is going to be so hard but I am excited for new adventures in this upcoming year, like starting my fourth year of university (talk about time flying by). Yes my year definitely won’t be as warm as this one but I know that it is going to be a good year. Honestly spring is a weird time of year in Ontario. One day it is snowing and the next day it is warm and sunny. The weather is changing from winter to summer but doesn’t know which season it wants to be in. Thankfully this year I don’t have to deal with Wheatley Spring (thanks Barbados), but to most of my readers you have to put up with it. So to help you, I have put together a collection of outfits that are perfect for Springtime in Canada. The good thing about this outfit, is that the skirt is paired with a long sleeve shirt! You could also pair it with a cardigan or sweater in case it gets chilly! But your legs have been hiding all winter long and it is time to break out some dresses and skirts. Also LOVE these wedges, I am definitely investing in a pair when I get home (hopefully I’ll find some at Winners!). A tank top and jeans is a perfect casual look for the spring weather. Bring along a sweater in your bag and you are prepared just in case! Also how cute is her bag? Wicker basket bags and mesh hole bags are in style this year and your spring outfit is the perfect way to debut them. Don’t be afraid to pair shorts with a sweater or cardigan! This outfit is the perfect example of how to style shorts when it isn’t yet summer. You can also wear some sneakers or flats if you aren’t ready to break out the sandals just yet! 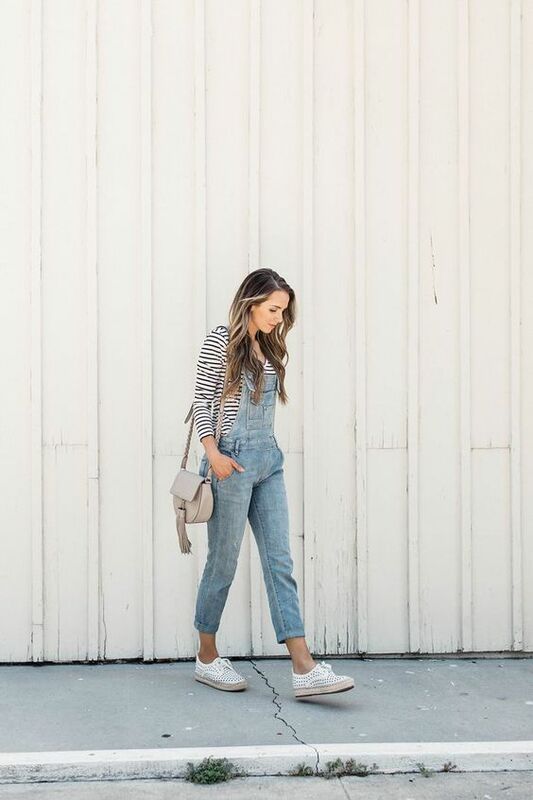 I said this last year and I’ll say it again, overalls are IN! They are also the perfect transition piece, as you can wear a long sleeve or sweater underneath without having to bring a jacket along! I am obsessed with this outfit! (I actually got my grams to look for the sweater in store for me but they didn’t have it). White jeans are an easy item to dress up or down depending on the occasion and are also perfect for spring. Pair them with a bright top to get rid of your winter blues! March has been a crazy month here in Barbados. A few weeks ago my Mom, Dad, Gramma and Grampa came to visit me for 10 days! School is at its busiest time, all final assignments and essays are do, tests are being written and presentations are being given. That being said, after taking a 10 day vacation, I have been playing catch-up for the past two weeks and I am finally nearing the end and I can relax again. On March 11th the family came to Barbados and we had an amazing time together. Our main activities were lying on the beach all day and snorkelling, and honestly I needed a break so bad. I have been so busy with school and with no reading week it is just constant work so I glad I got to get away for a little bit. I also got to go scuba diving with my Dad which was a lot of fun. He did a Discover Scuba course with Barbados Blue (the dive shop I dive with) and he learned the basic skills then got to come diving with me in the ocean! He was really lucky and got to see a baby octopus which is really cool. My Mom and Gramma are actually the best/coolest people ever and they decided to re-celebrate my birthday when they were here. My Gramma made me a pink birthday cake and my Mom brought me a deep dish pizza all the way from Chicago. If that isn’t true love people I don’t know what is. We actually ended up planning our next vacation while they were on vacation, and I am super excited because we taking a girls trip to Mexico in October! I am so excited to go diving in the Pacific Ocean, hopefully with some dolphins or whale sharks (fingers crossed!). It was an amazing trip and I’m glad I got the chance to show them where I have been living for the past 7 months. Next up is Ivy and Elle in May! It was bittersweet to see them leave, but I know my last two months are going to be a lot of fun and are going to fly by. I know that it is going to be super hard to leave this island which has forever gained a piece of my heart. Going on exchange means meeting new people and learning new things. Well boy am I glad I met Jana. Jana is from New Brunswick and is a super track star. One day a bunch of us got together for a potluck and Jana brought these Banana Oat balls and she gave me the recipe for them. Ever since, I have been addicted and they are my favorite go-to snack. Jana heard about the recipe from a Youtuber called Madeleine Olivia. And has been making them ever since. Here is her recipe guide to making the Banana oat balls. I have somewhat modified the recipe to my tastes, so I usually add more oats so that the oat/banana mash is very thick. You could also add some peanut butter or protein powder for something a little extra. Also instead of raisins I like to add cranberries but you can also add chocolate chips! I usually bake enough balls to last me the week so I keep them in the fridge so they last longer and I prefer them cold. Well another year has passed, yet in some ways everything feels exactly the same. Last Wednesday was my 21st birthday and honestly I was a bit sad not to be at home having reading week and having a party with the fam jam. But, I have some really amazing friends here and they made my day so so perfect. I only have one class on Wednesday’s so it isn’t a bad day school wise and it was even better when my friend Camryn found out that most of her classes were cancelled for the day which meant she could hang out with me all afternoon. We went to the beach and it was so so hot, but it felt so good to jump in the ocean and then warm up on the sand. I had made reservations at a fancy Italian restaurant on the south/west end of the island called Buzo. If you are ever in Barbados and in the mood for some really amazing pizza then this is the place you have to go to. 6 of us went out and it was a really fun dinner; I had a glass of champagne, pizza, and they even brought me a piece of cake and sang happy birthday. Even though it was late when we got back, Emily and Jana said they had another surprise for me. They told me to close my eyes and when I opened them I had a cake in my hand. Not just any cake, a pink cake with sprinkles that said “Happy 21st”. I am seriously blessed to have such good friends. Time is starting to fly here in Barbados, probably because I am having so much fun. My weekends are jam packed with homework, scuba diving, beach time and adventures around the island. On Saturday, a group of us made a trip up to the North point of the island to see the Atlantic ocean and the crazy waves. School has actually been going pretty well this semester. I am taking three French classes and two Political Science classes. I tried to schedule my presentations and projects early in the semester so that I didn’t have to worry about them when my parents and grandparents come. So this week I had two presentations and a test, which I am glad I got over with. I can’t believe the fam jam comes in almost a week! I am so excited!!! This weekend I have another busy weekend ahead of me including two dives on Friday and a cave tour on Sunday (if you have every visited Cenotes in Mexico I think it is going to be like that). A few weeks ago I spent 2 hours swimming in the ocean (and free diving in some parts) to collect garbage underwater with my friend Camyrn. You probably hear about climate change, wildlife dying, and consumption reduction at least one a month on social media. Then you probably think, I am just one person, it isn’t going to make a difference. The ocean has become a major part of my life and for the past five months I have probably spent more time in water than on land. When I got my scuba certification in December, I started to realize how fragile the aquatic ecosystem really is and how plastic, metal, and just junk can have a major impact on it. Buy a reusable water bottle. Chances are you probably have one kicking around in your house anyways, so put it to good use. I find so many water bottles on beaches, the side of the road, and even at the bottom of the ocean. Here is a picture of my Hydroflask. Not only can you decorate them but they hold almost the amount of two plastic water bottles! 2. Actually use your reusable bags. You probably have a stack of these hiding in your house, that you have boughten with the best intentions but you never actually use them. A good way to remember to bring them with you is to put them by the front door or your house or keep some in your car. This way you will see them and grab them ever time you go to the store! 3. Start composting! Ever since I was a little girl, my dad taught my sisters and me the importance of the environment which included how to compost. It is so easy to just keep a bin (with a lid) on your counter and fill it will things that decompose. This includes things such as vegetable peelings, coffee grinds, egg shells, and even paper towels. You can then use this compost for your garden to help nourish your plants and vegetables. 4. Buy clothes at the thrift store. Some of you may already do this, but instead of always buying new clothes go to the thrift store. Sometimes you can find really cool, awesome, and sometimes even new clothing. This can reduce so much waste! Also when you are done with clothes you no longer wear, you could have a clothing swap with friends or pass stuff down to family members such as cousins! 5. Stop buying and using single use plastic such as plastic plates, forks, and straws. Single use plastic is horrible for the environment, essentially due to the fact that it is single use. 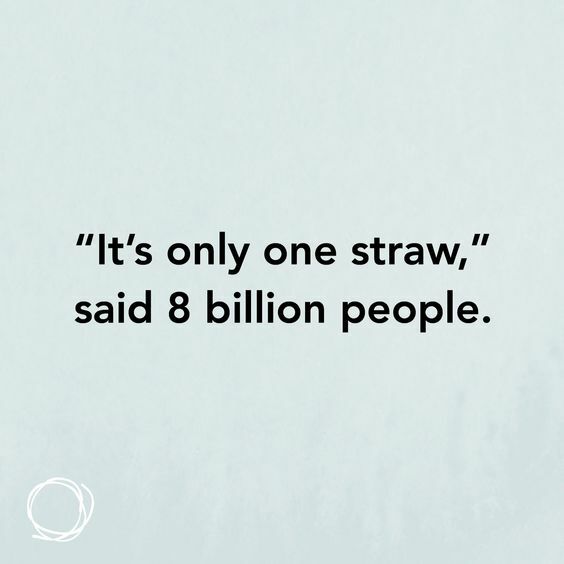 Instead of using plastic, opt for a wooden cutlery set and reusable straws. This way you can carry them around with you and when you need to use them you can pull them out of your purse or backpack. Overall, little daily changes can start to make a huge difference. One person CAN make a difference and if we all work together we can change the world. Hello everyone! I know I have been a little MIA since the new year began, but I have been pretty busy enjoying time with my family and also going to Europe! As I mentioned in a post last year I decided to book a trip to Europe with my Gramma for my last two weeks of Christmas break. On January 8th, my Gramma and I left Detroit, Michigan on a flight for London, England. We spent 3 nights in London followed by 3 nights at one of my old host families homes from when I lived in France, and finally we ended with 3 nights in Paris. I can’t even begin to describe how much fun I had with my Gramma on this trip so I will give some of my favorite highlights! For years now I have been obsessed with Les Miserables and I have dreamed about seeing it live. When my Gramma and I found out that there were shows when we were going to be there we booked tickets (IN ROW 5!!) right away and I’ve been excited about it for months. It was by far the best musical I have seen live and I spent 90% of the show with my mouth open in awe. We also went to Kings Cross station to visit Platform 9 and 3/4 and I even got to ride the trolly into the wall to visit the school (*cough* *cough* my next year abroad). When we left England we took a flight to Paris where my “French grandparents, Mamie and Papi” picked us up. Not only did I get to see Mamie, Papi and their kids but I also got to visit Flore and Laurent (my second host family) which was really nice. It was a little weird going between English and French (because Gramma does not speak French), but Gramma really started getting the hang of it and could even make sentences with a little help. We finished our trip off in Paris, staying in a tiny tiny hotel room which made it that much more authentic. Both Gramma and I had never been to Versailles so we took a train out to go and tour it. It was so amazing to see it in person after learning so much about it and always seeing it in pictures. It was a little rainy but we did still get to see the beautiful gardens and we’ve decided to go back in warmer weather for a picnic. Because we couldn’t have champagne in the gardens, we decided to splurge and have a glass in the chateau and shut up, it was amazing! On our last night we decided to go to a restaurant that I have dreamed about since seeing it in 2014. The little restaurant is in Bercy and their speciality is aligot (a mixture of mashed potatoes and cheese). It is seriously the coolest and tastiest food ever and we might even try to recreate it at home. Our trip was so good we have already started planning where we want to go next, so far Spain and Italy are on the list. For those of you that know me, you know I love shopping. I’ll admit, I have a slight shopping addiction. I love finding good deals and I have been known time and time again to buy things just because they are on sale, or are under $5. Since 2017, I have been following a women on Instagram called Meg or @meghall on Instagram. This year she is doing #NoShop19 meaning that she will not be purchasing any clothing, shoes or house related items for herself all of 2019 unless it needs (needs) to be replaced. She has been talking about doing this for a few weeks and it got me to thinking about my slight shopping problem. When I was trying to stuff the new clothes I got for Christmas into my already full drawers I realized that I needed to make a change. Yesterday I decided to start the New Year off right by cleaning out all of the clothes that I do not wear anymore/ clothes that do not fit me. This lead me to having a massive bag that I was going to donate to goodwill. My mom also suggest that I put some clothes online to sell (stuff that hasn’t been worn, or in good condition) and I did just that. This year I am going to try to buy less than I do every other year. That means, not going shopping every weekend because I feel like I deserve a treat and instead embracing my (if I say so myself) fabulous wardrobe that I have spent way too much on already. Of course I will probably go shopping while in Europe next week, but I will still have my mindset of buying less and buying only unique pieces, instead of average pieces just because they were a good deal. I hope that this gives me a new perspective going into 2019 and I hope this year is filled with experiences and memories instead of items. P.s. If you are looking for some super cheap and cute clothing to start your New Year off right you can follow me @libbeyjeanscloset on Instagram to see the pieces I am selling! In May I decided that I wanted to learn how to scuba dive. I was going to get my certification in Canada but with work I didn’t have too much time and diving in a lake does not sound that appealing to me. I decided that I would get my certification in Barbados and I am so glad I did. I finished my exams on December 12 and I signed up for my Open Water Certification class for the 13th, 15th and 16th at Barbados Blue. I called my Mom after I finished diving in the ocean on the 13th and all I could say was “THIS IS THE BEST DAY OF MY LIFE”, “THAT WAS AMAZING” and “I LOVE SCUBA DIVING”. Seriously it was one of the most incredible experiences of my life, which is why I decided right away that I wanted to sign up for my Advanced Open Water Certification. And I did just that. On the 17th I did an e-learning course for the Advanced course and then I started in water training on the 18th. With the advanced course I got to dive to 100ft which is literally crazy when I think about it now. I also got to dive through some shipwrecks which was super cool. I got to see a ton of aquatic life on all of my dives including sea turtles, sting rays, lots of coral and fish, sea snakes, eels and even some super rare seahorses. Sadly, I did not have an underwater camera with me so I couldn’t get any pictures in the water but next semester I will hopefully get lots of cool pics. It is crazy that I did two different certifications in six days but it was so worth it. I did get pretty sea sick on the 16th and when I got back on the boat on the 18th I instantly felt sick again. Because I was usually doing two dives in the morning, we would get dropped off of the boat, go diving for 45-50 minutes, get back on the boat and wait for anywhere from 45-60 minutes (to allow excess nitrogen to leave the body), and then go diving again for another 45-50 minutes. The main issue for me was the wait time in between dives, so I ended up floating in the middle of the ocean beside the boat so I would not feel the boat rocking. Next semester I plan to go diving as much as possible (and as much as I can afford to) because I will never get a chance like this again to go diving whenever I want to in the Caribbean Sea. Overall, I think everyone should try scuba diving once in their life but be warned, it is super addicting. I know it has been a few weeks, but I have been studying away trying to pass my four 60% exams of death. Thank goodness they are over and I am now back to going to the beach everyday and living on island time. Thanks to Kenny, I actually have a Christmas song that I can relate to. And it’s true I am working on my tan so that I look like I am a true beach bum and to hopefully beat my Aunt Karen’s incredible tanning skills. I am officially finished my exams which means that I have to recuperate from sitting in room for the past two weeks studying. Let’s just say I don’t remember what it is like to look this pasty. Yesterday, was probably one of the best days of my life. I took my first class for my PADI Open Water Scuba Certification and it was amazing, awesome, wonderful, beautiful and crazy exciting all mixed into one. My instructor Kane is really nice and he said I was a natural. I spent the morning in the pool with him learning skills and then he was like “okay time for the ocean!“. And I was like “whattttttttt“. Let’s just say I was not expecting to go diving in the ocean in my first class. But I am so happy that I did. We dove to 40ft and we saw some sting rays, sea turtles, a seahorse and some shipwrecks. Literally now my snorkeling seems so lame compared to what I was seeing under water. I have now spent 48 minutes underwater and it only goes up from there. I have a completely new respect for the ocean and the earth in general, I still can’t believe how lucky we are to live in a world filled with all these different wonders and beauties. Today, was my break day so this morning I went to go and pick up my passport because my visa was ready. After I got back from the immigration office in Bridgetown, I went to the beach with Meike and Emma and Tyler met us there. We spent quite a bit of time there and let’s just say my pasty skin did not take too well to being reintroduced into the sun for that long. When I was sitting on the beach I was thinking about how bittersweet it is going to be to leave the warmth and ocean. Tonight we are headed to Oistins for the last Friday night fish fry of the year! Tomorrow I go back to scuba and write my exam, so wish me luck!